This ultra concentrated carpet prespray is ideal for cleaning heavily soiled traffic lanes and overall carpet preconditioning. At a 1:32 – 64 dilution (depending upon carpet construction and soiling conditions). 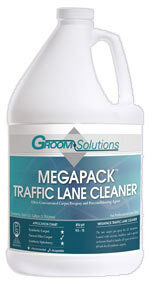 Megapack Traffic Lane Cleaner delivers cost-effective, high quality cleaning at concentration rates unrivaled in the carpet cleaning industry. It starts to work as soon as it is applied and literally melts away even the most stubborn soiling as it dissolves, emulsifies, suspends and deflocculates soil and grease. It powers through the filthiest grime without harming the carpet fiber or construction. Whether you are cleaning filthy restaurant carpet or high end residential carpet, MegaPack Traffic Lane Cleaner will deliver superior cleaning results, safely and effectively. Its non-residual, VOC compliant formulation means that it cleans without contributing to re-soiling and is compliant with VOC standards in every state. Megapack meets or exceeds industry standards for the safe and effective cleaning of stain resistant carpet, as well as all synthetic residential or commercial carpets. For normal soiling and use with the regular 1:8 Hydro-Force Sprayer, dilute 1 part Megapack to 6 parts water. Do not allow carpet to dry before extraction. For heavy soiling and use with the 1:8 Hydro-Force Sprayer , dilute 1 part Megapack to 3 parts water. Do not allow carpet to dry before extraction. For normal soiling, dilute 2 oz. Megapack to 1 gallon hot water (1 to 64). For exceptionally heavy soil, dilute 4 ounces per gallon (1-32). Spray until carpet is damp. Extract with your normal process. Do not allow carpet to dry before extraction.